In this Aug. 22, 2017, file photo, people pass by a Village Voice newspaper stand in the East Village neighborhood in Manhattan. 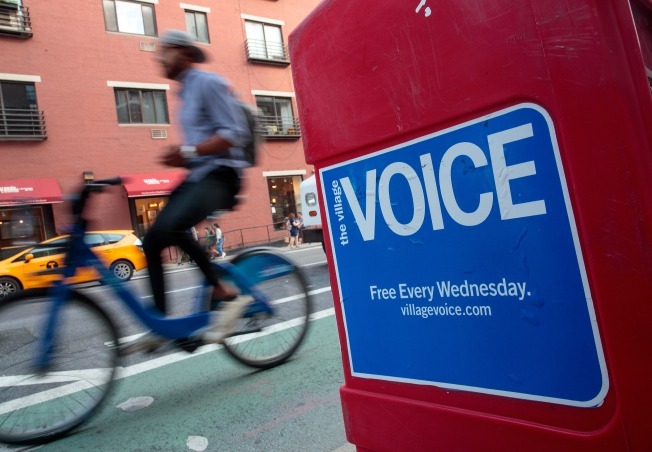 The Village Voice, the United States’ first alternative weekly newspaper, is suspending editorial content, according to the Columbia Journalism Review. The end of the fabled New York City outlet -- which was founded in 1955 -- was announced in a conference call on Friday afternoon, according to the Review, which also obtained audio of the interaction. In it, CEO Peter Barbey, told employees that half the staff would be let go while the other half would stay on for an archive project. “Today is kind of a sucky day. Due to the business realities, we are going to stop publishing Village Voice new material,” said Barbey on the call. “I bought the Village Voice to save it. This isn’t exactly how I thought it was going to end up, and I’m still trying to save the Village Voice,” he said in the call. NBC New York has reached out to the Voice seeking comment. The editorial suspension of the Voice comes a little less than a year after it stopped publishing a weekly newspaper. It's just the latest salvo in a barrage of layoffs and closures that have besieged the newspaper and alt-weekly industries in recent years.